I need some help from my fellow Mystaraphiles to find a reference. Trintan is a small town in southern Glantri. I recall reading somewhere about the ruler of Trintan. But, I cannot seem to find that reference. IIRC, the lord, mayor, and or ruler was supposed to be a rather fat man that had a pet cat. And, in the reference, which I believe was an officially published adventure, there is a brief writeup about the adventurers going into Trintan and meeting with the "mayor." I looked in HWA1 and also DUNGEON Magazine #20, with the adventure "Pride in the Sky," which I thought might have this information, too. But, I did not find anything in either of those. Does anyone recall where this description was? Thanks for any help. It looks like there was a map of the city of Trintan in Gaz 3, but I don't recall a description of the city there though. The other possibility could be the PWA. I checked the Vaults and found descriptions in the MAs. Unfortunately I couldn't find anything about the mayor specifically. Dungeon #22 might be what you are after. Not sure about the fat man with a cat, but it is an adventure that ends up in Trintan, with a map of the village. Here is a map I made as an improvement of the existing map on the Gaz3 map....maybe more about Trintan can be found in Gaz 3, GKoM and Dungeon 22 page 50-64 Adventure "Rank Amateurs"
I just had to check Dungeon #22. The "rather chubby" mayor with a "scraggly orange cat with a misshapen eye" is in there (p. 63). He goes by the name of Ivroigne, the cat is his familiar Guillame. (He is a M-U 6, btw.) So, the OP was right about this. Lord Ivroigne, master wizard ofTrintan, is chubby and has a cat. He appears at the end of the adventure. Wasn't Trintan featured in the video game Shadow over Mystara too? Yes, Trintan also serves as the backdrop in the early battle with the goblin warmachines in Shadows over Mystara. I couldn't find much about the mayor but in Gaz 3 as a free territory Trintan would be directly controlled by the Council of Princes . stebehil wrote: I just had to check Dungeon #22. The "rather chubby" mayor with a "scraggly orange cat with a misshapen eye" is in there (p. 63). He goes by the name of Ivroigne, the cat is his familiar Guillame. (He is a M-U 6, btw.) So, the OP was right about this. Morfie wrote: Dungeon #22 might be what you are after. Fast and great responses, everyone. I knew I could count on this group. Thanks, stebehil and Morfie. I guess I had forgotten about that adventure, and that it ended up in Trintan. Thanks for the map and pic, Robin. I kind of like these fun little "add-ons" of possible "canon" locations gleened from video games and other sources, even if they're not terribly realistic sometimes. 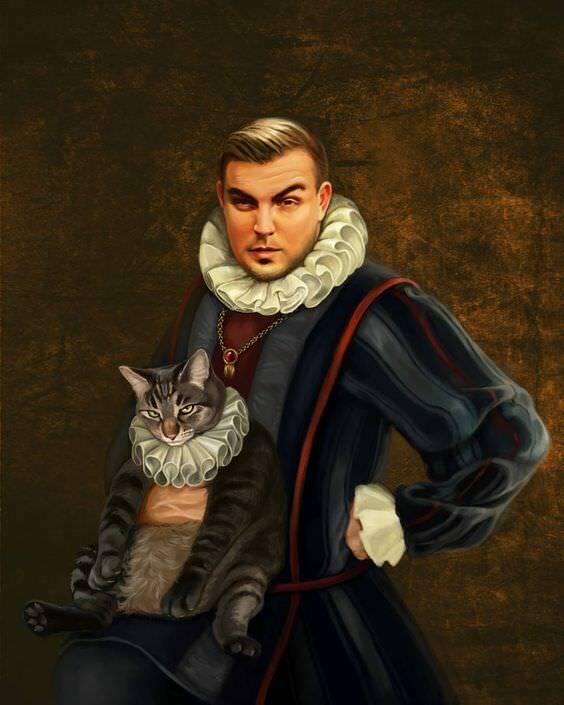 The reason I was looking for this was that I saw a picture that was close to what Ivroigne and his cat could look like, below. But, alas, the picture is a little bit amiss in that the man is not very heavy and the cat is neither orange nor does it have a misshapen eye. Would this manipulation suffice then? Cat is now orange with mishapen eye, man is significantly fatter. Thanks, Robin, this is great!